This year, I turned 31 years old. I usually celebrate my birthdays by going to a nearby buffet, pigging myself out with amazingly good food. I decided this year to take it up a notch - buffet and staycation. Been wanting to do some rest and relaxation for months on end now and finally got the chance to do so. Booked my stay at Red Planet using their app because who calls hotels and book their reservation when there is an app that can take care of that. When you use their app, you actually get 25% off discount when you stay at Red Planet on your birthday month. On regular months, you get 10% off when you sign up! The room is actually big enough for 4 people, I think. Haven't tested that but it was really wide for more than 2 people. Since, this is a first for me, they prepped the room for occupancy, the room had clean sheets and amazing soft duvet covers. I wished they had more pillows, like 3 or more. Switched on the room's AC on full blast, got my feet up and what's there to do at any hotel room than eat and watch cable TV? I chose the Ortigas branch as it's nearby my favorite malls: Edsa Shangrila and Megamall. Did I mention I am in love with the Rustan's Marketplace gourmet sandwiches? Yes, I had to buy 2 to go and well found out they had Vanilla Coke and I had to buy those too. What? It's my birthday - stop judging! The room has a retractable table for work or not work. The room has complementary Wifi access and you can connect as many wireless gadgets as long as you have the wifi password. Mind you, you can update all your apps but you are not allowed to download stuff - good call there! Heading out to the buffet, I had to try the in-room locker. It holds itself up and was able to keep my personal belongings safe while I was away for dinner. The bathroom is utterly amazing, they even provided 2 bath towels and a small towel for your foot. The space had enough soap dispensers in case you forget and yes they had one of those 3-in-1 soap for times when you thought you can thought you could buy something from the nearest convenient store but never really got to doing. Shower head was really wide - I love wide shower heads cause it can get to places you cannot reach. Cold and hot temperature control for your bathing needs. 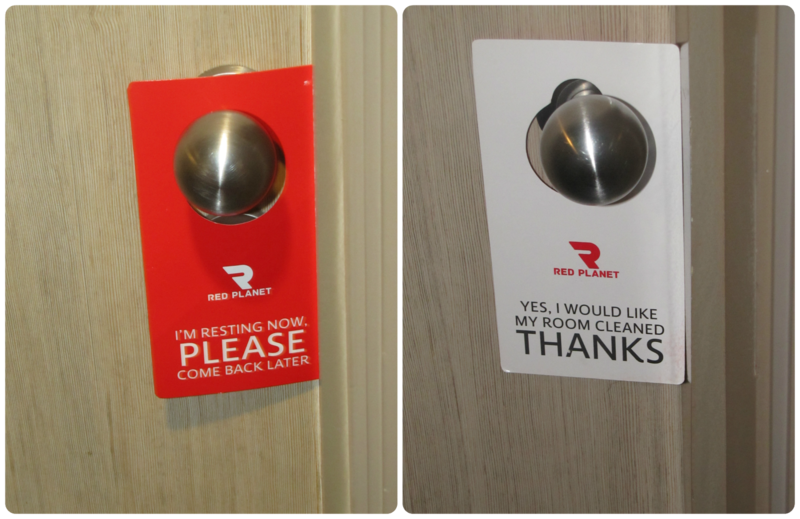 Heading out, you can opt to have your room cleaned by just choosing the right side of your door sign. Red means do not disturb while White is for house cleaning. Definitely a good place to unwind, do not expect for swimming pools. They do not have any however I love how the staff were very accommodating and friendly. The guards were very kind and helpful. I love the space and the vibe around the place. I would love to go and try other branches hopefully outside of the country. Here's to hoping.